The 'New Chapter' art installation - to be displayed at our Art Exhibition in June - has developed from our 'crafternoons' , at which approximately 15 invited guests - Yes, No, and undecided voters - work together, eat together, laugh, and chat informally about life. If they want to, they can also worry aloud about their voting intentions and share their thoughts about the referendum. We've been working on, among other things, creating 307 'altered' books to represent the 307 years of the Union, and an 'Urn for the Ashes of the Union' (more information here). Above all, however, we've had fun! There'll be one more crafternoon before the art exhibition, so please contact us if you want to be involved. Three high profile artists are collaborating with the project: Isabell Buenz, paper artist; Professor Robert Crawford, poet; and Richard Ingham, international saxophonist. 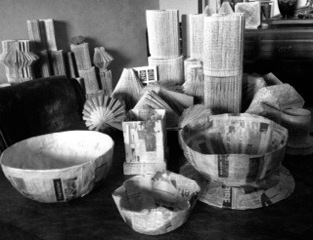 Installation art created at one of our crafternoons!